Philadelphia, PA (April 15, 2010) - The Environmental Protection Agency (EPA), in the last several months, has introduced new regulations to strengthen certain national ambient air quality standards. On Thursday, April 22 at 11 a.m., McIlvaine Company will host "Impact of Ambient Air Rules for Fine Particulate Matter and Ozone on Fossil Fuel Power Plants" during their weekly Hot Topic Hour. 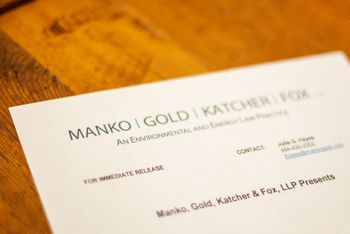 Katherine L. Vaccaro, an attorney with Manko, Gold, Katcher & Fox, LLP (MGKF), the environmental, energy and land use law firm based in Bala Cynwyd, PA, will be part of a panel of experts presenting during the session.